Sydney (NSW), Australia – Australian privately-owned conveyor component OEM, PROK Conveyor Components Pty. Ltd., a Nepean company, has finalised negotiations to extend its conveyor component capability with the addition of a fully operational specialised OEM pulley business based in Gosford, NSW. NEPEAN Chief Executive Officer, Miles Fuller, says the new business is a perfect extension to our conveyor pulley capability in key mining regions and will strengthen PROK’s offering to customers on the east coast of Australia and internationally. With the integration of Tefco Engineering’s assets, PROK are positioned to provide customers in core mining regions with a dedicated and local option for OEM pulleys and pulley overhauls. 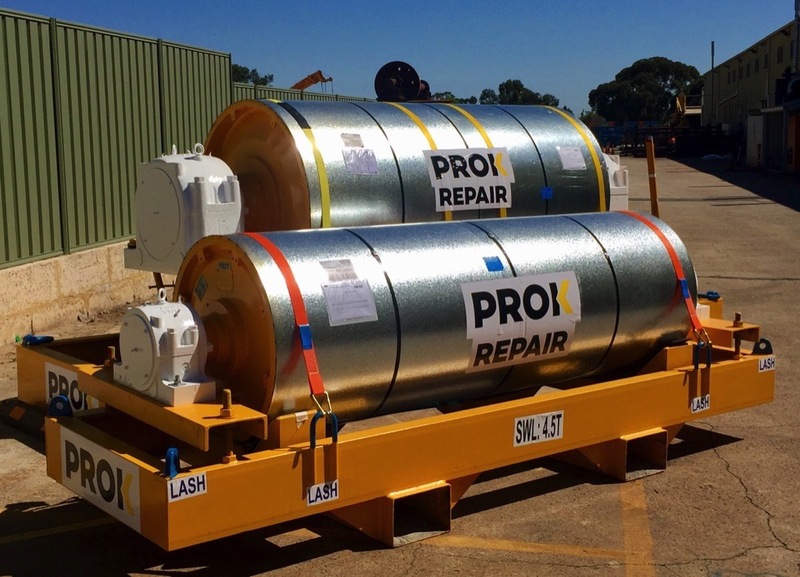 “PROK Conveyor Components gains a significant conveyor component manufacturing facility in New South Wales. The new facility will be integrated with our existing PROK business with a focus on growing, improving and innovating to ensure that our customers are the winners” says Mr Fuller. The acquisition includes over 3,500 square meters of manufacturing operations in New South Wales. The additional manufacturing capacity bolsters PROK’s existing capability with six over-head cranes, plate rolling, state-of-the-art CNC machining, in-house stress relieving, shot-blasting, painting facilities and specialised pulley acceptance testing equipment. “Founded in 1985, the conveyor business is core to NEPEAN. Since 1985, NEPEAN Conveyors growth and success has been due to our customer focus, local support capability, passionate employees, leading engineering, and empowered managers with the authority to get things done. Putting the needs of customers first is part of NEPEAN’s DNA. We can only prosper if our customers are successful and we are deeply committed to this responsibility. We see this acquisition as a very exciting opportunity to improve our ability to serve our customers” he said. “NEPEAN’s relentless drive to deliver for our clients will ensure customers benefit from reduced lead times, and have access to quality conveyor components for aftermarket and major projects in more locations,” says Mr Fuller. NEPEAN is already the largest manufacturer of pulleys and idlers in Australia, and one of the largest specialists in conveyor components globally. Through operations in six continents, NEPEAN produces thousands of large engineered pulleys and millions of rollers for distribution to over 66 countries. “Our service offering and the wider suite of products, positions NEPEAN as the number one choice for quality conveyor components. Our passionate employees, technical strength, lean overheads, vertically-integrated capabilities and the respect we have earned from the industry since NEPEAN was founded in 1974 has positioned us for this exciting growth opportunity,” says Mr Fuller. “Our investment in the Tefco Engineering business, and more importantly Tefco Engineering’s customers and employees, is a further commitment to an industry we know well. It is a step in NEPEAN’s journey to be the global leader in innovative conveyor components,” concludes Mr Fuller. NEPEAN’s conveyor expertise in Australia includes fully-integrated bulk materials handling solutions from the mine to the train or truck load station. With the integration of Tefco Engineering’s assets, NEPEAN are positioned to provide a more complete offering to the market.